Note: Field paint only on Weekends. Bring your own on Wednesdays. Included in the prices above is rental equipment (Please note: when Available), and CO2 for the day. Paint sold separately. If you bring your own equipment group rates will be lower; call or email us for specifics. Are you interested in having the competitive edge over your competition? The A-5 is one of the fastest shooting paint guns on the market today. With the RT trigger the average player can shoot it like a pro. The RT allows anybody to squeeze off 14 paintballs a second (a 98 only shoots 9, if you can handle pulling the trigger fast enough). With the A-5 cyclone feed your guaranteed not to skip shots on the field, unlike the 98 Custom. 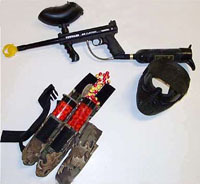 Find out more about the A-5 at tippmann.com. Providence Paintball also carries a full line A-5's in stock with your choice of upgrades.